NEWS: We were excited to have the opportunity to exhibit our tents this year at the OUTDOOR RETAILER SHOW in Salt Lake City from 8/8-8/11/2008. After over a year of design work, we showcased our new patent pending pop up self erecting style tent and it got rave reviews and generated a lot of excitement from visitors at our booth. The show allowed us to show off our newly designed tents and also spotlight the versatility of our tent manufacturing that we have done for the Girl Scouts, US Military, Jack Daniels, Snap-On Tools, Grand Canyon Expeditions, Naturalists at Large and a host of other outfitters, retreat centers, and individual campers. Of course, along with all the work we got to have some fun too. The outdoor industry has a unique casualness and we met a lot of friendly people, attended some great parties at the show and gatherings outside the show. I would recommend doing whatever you can to make your way to the show in the future as you get to see all the new gear and it is always a fun time by all. Hope to see you all there next year! Check out and order our limited offered Pop up Tents. Here is the much awaited redesign of our pop up self erecting tent. 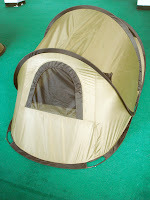 It is much more durable and waterproof than previous self erecting tent designs. It has an unbreakable spring steel frame. We listened to your suggestions and worked on better materials and a new roof design. We are making 4 different model tents. 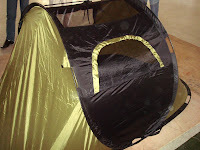 These tents started shipping at the end of November 2008. We are manufacturing limited quantities and you can buy one now at our consumer website. Please leave us a comment if you have some time. See a video of how easy it is to set up and fold our pop up tents at the following links - Setting up the Pinnacle Pop up Tent. Folding the Pinnacle Pop up Tent.